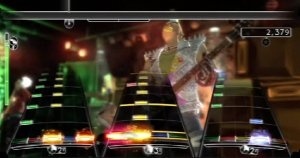 Konami has slapped Rock Band maker Harmonix with a lawsuit, claiming the hit rhythm game violates patents held by Konami in connection with its own music games. According to a Bloomberg report (via MCV), Konami is claiming Rock Band violates patents issued to the company in 2002 and 2003 relating to simulated musical instruments, a music-game system and a "musical-rhythm matching game." Konami was a pioneer in the music videogame genre, releasing the hit Dance Dance Revolution in 1998 and Karaoke Revolution a few years later. Rock Band was one of the biggest videogame hits in 2007 despite not being released until the end of November in the U.S., and late December in Canada, earning widespread critical and commercial success. But it's also been a bit of a legal headache for Harmonix, publisher MTV Games and distributor EA; prior to the Konami suit, the companies were sued by Gibson Guitar for violating a patent for "a system and method for generating and controlling a simulated music concert experience." Konami is seeking a cash judgment against Harmonix, as well as an order preventing Harmonix and its owner Viacom from using its inventions and technology in the Rock Band games. The company also claimed it would begin selling its own Rock Band-style game, called Rock Revolution, later this year. Viacom has not yet commented on the lawsuit.